BlizzCon 2014 has ended, and we hope everyone enjoyed the celebration of all things Blizzard. We certainly did! There wasn't a lot of discussion on Pet Battles and pets in general during the convention this year. However, there was an inquiry about the future of Pet Battles during the WoW Q&A. Developer Cory Stockton noted that they are happy with Pet Battle gameplay, and that they plan on adding depth by introducing more content such as additional NPC battles, new pets and more consumables. Their goal is to continue supporting Pet Battle gameplay in future expansions. New Charity Pet Coming Soon! It was also announced that between December 3 and December 31, 100% of the proceeds for every Argi adoption will be donated to the American Red Cross Ebola relief efforts. Not only will this pet be a wonderful gift for a loved one this holiday season, it's heartwarming to know that collectors will be supporting the Red Cross and helping those in need. We look forward to welcoming Argi into our collections this winter. We'd like to thank everyone that attended the BlizzCon 2014 WarcraftPets Meet-and-Greet. 55 WarcraftPets lanyards were handed out, and our good friend Steve from Wowtcgloot.com surprised everyone with common pet loot cards! 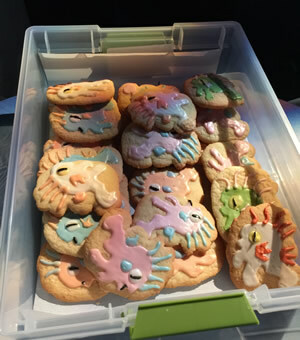 A big thank you to user Marzena who brought delicious homemade cookies once again to the WarcraftPets Meet-and-Greet (check out the "Crazy Cat Lady" cookies from 2013). This year the tasty treats were murloc-themed (pictured right). Whether as a pet or in cookie form, who could resist acquiring a little murloc! Thank you to everyone that stopped by the Meet-and-Greet to say hello. 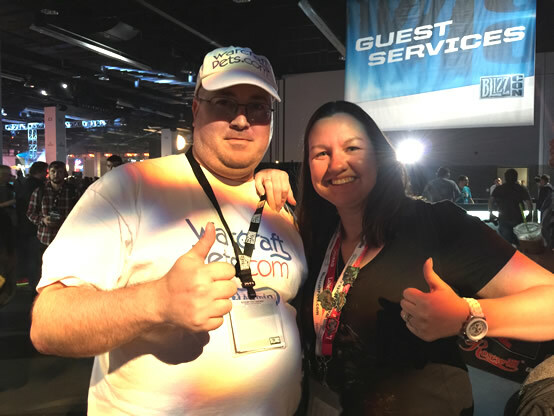 We look forward to the next BlizzCon and WarcraftPets gathering! And of course, thank you to ALL of our users for your continued support. I was so glad I found the time to hang out with you guys, if only for a few minutes. I'm already eagerly awaiting next year, eee!